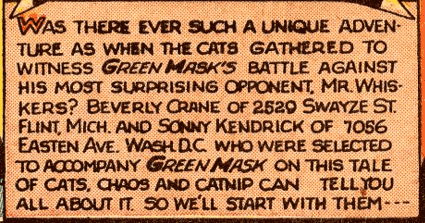 Um, is this how The Green Mask selects his sidekicks? Was there a sidekick lottery? Tens will enter, only two “lucky” contestants will win? Anyway, I would love to find one of them (…Google yielded no results), knock at their door, and ask them (…after what, 66 years?) to tell me all about it.